As a skier, I’m constantly in search of empty fields of white far from the crowds. So the idea of my local ski area acquiring new mountainsides to plunge down sounds like a good way to disperse hoards of fellow snow bunnies into wider pastures. This year in California, skiers and boarders have been gushing over the merger between Tahoe’s Squaw Valley and Alpine Meadows, a connection that now allows patrons to access the two resorts using one lift ticket. Even more exciting is the potential that we’ll get to ski in the undeveloped wilderness behind each resort to get from one to the other through a backcountry access gate (an internal pilot program to test this traverse starts this winter). Eventually, says Squaw Valley spokesperson Amelia Richmond, there may even be a series of chairlifts connecting the two mountains. It’s also rumored that JMA Ventures, Alpine’s former owner that still owns nearby Homewood Mountain Ski Resort, has looked into connecting Homewood to Alpine–clearing prized backcountry wilderness in its path. But the Ski Area Citizens’ Coalition, which grades ski resorts on their green practices, sees this type of development as something else entirely: a devastating blow to untouched natural reserves. Transforming a mountainside into a ski hill makes it unavailable as habitat to most species, and denudes land, making erosion more likely. New ski runs also mean more energy-guzzling chair lifts, which add to the emissions you’ve already created by driving to the resort. And making new snow to cover these runs depletes streams in already drought-ridden areas, as well as uses energy and contributes to global warming. That’s just the beginning, says SACC: Ski resort land development paves the way for a real estate creep from incoming hotel chains, condos, and outlets. At the core of SACC’s research efforts lies the nagging question: Do we really need to ski more terrain? The SACC grades Western ski resorts on 36 criteria, ranging from snow-making practices to investment in biodiesel, to educate winter sports nuts about which ski area to choose if they care about their environmental impact. Released in an annual report card, the grades reflect info culled from public records, development plans, and surveys filled out by each resort. Squaw actually tops the list of Western resorts, earning major points for not introducing new snowmaking, wetlands rehabilitation efforts, and maintaining its existing boundaries. The Lake Tahoe ski area came out ahead of even solar energy superstar Aspen Highlands. Keep in mind that the SACC heavily weights its scorecard against any plans of development. For instance, Colorado’s Breckenridge resort is second-to-last on the 2011 list and received a mere 50.1 percent. This likely reflects a proposed expansion plan in old growth forests and Canadian lynx habitat that’s making enviros cringe, as the Denver Post points out. And take a look at Las Vegas Ski and Snowboard Resort, which was recently approved for a $35 million master development plan involving 50 new trails and 10 lifts: It scored a 60.9 percent in the SACC’s rankings, ninth from the bottom. We’ve mapped the results below, so you can compare your favorite ski spot’s eco-consciousness with that of surrounding areas. SACC makes a compelling defense of its antagonism towards development: While ski resorts largely seem pressed to continue expanding bounds, the number of skiers and snowboarders each year has not increased at the same rate. 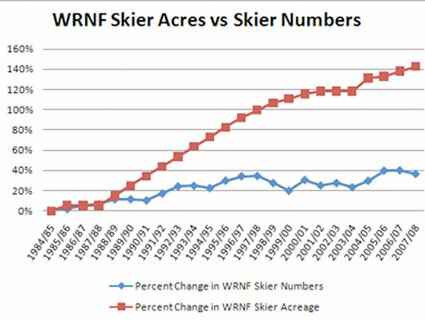 The graph below shows this precise comparison for the White River National Forest in Colorado. Ski Area Citizens’ CoalitionA 2011 survey of skier visits shows the number of skiers at resorts hasn’t jumped up dramatically nationwide, and in some cases, has decreased or stayed the same during the last five years. In 2011, the number of skiers in the Pacific West was down to 12.15 million from 12.26 million the year before, despite a monumental powder season for much of the region last year. Imperfect though it may be, the SACC report card can keep ski resorts in check, holding them accountable for their green promises, and making development plans visible to the public. This is especially useful now that every resort now has an environmental marketing branch, ready to brag about shiny new wind generators. Though skiers pride themselves on being in touch with the outdoors, their sport has the potential to permanently transform mountain landscapes—making it pretty crucial to keep an eye on development. When plans of expansion are nigh, has a resort like Squaw done everything it can to take advantage of existing and already disturbed terrain? And with skier numbers holding steady, do we really need new real estate?